Sometimes three can be a hard combination to maneuver. Our society favors couples; hence someone will always be the odd man out. 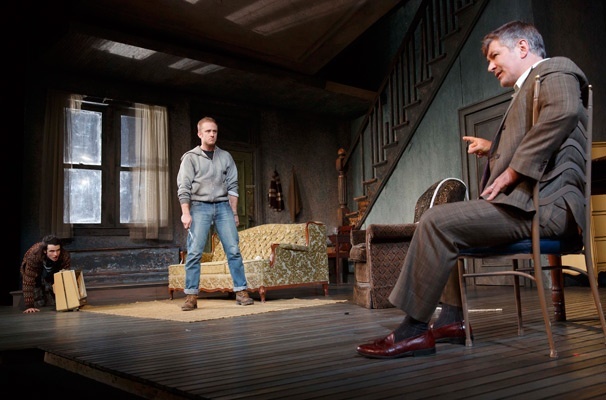 But I have witnessed an exception, Lyle Kessler’s Orphans has three good reasons for going to taking a trip down to the Gerald Schoenfeld Theatre – Alec Baldwin, Ben Foster and Tom Sturridge. Orphans tells the story of two parentless brothers barely surviving on the hard streets of North Philly. Older brother Treat resorts to petty crime and manipulation to take care of younger brother Phillip. Living in a dilapidated home and eating tuna fish every day isn’t a satisfactory existence for Treat. He attempts to upgrade his station by kidnapping a bigwig for a big payday, but he and Phillip get more than they bargain for with Harold. Harold, also an orphan, provides the boys with a warped sense of stability and a father figure. We have all heard the saying, “honor amongst thieves.” When actors come together to bring life to a script, they must bring integrity to the role as well as respect for one another. The cast of Orphans does this in an impeccable fashion. Each one of these actors played their role as if it was created for them. 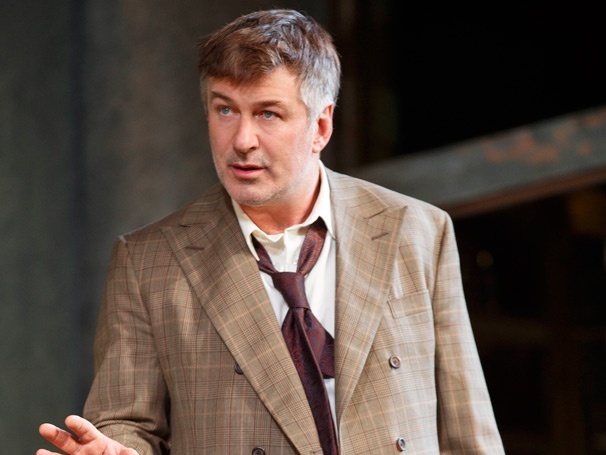 Alec Baldwin is Daddy Warbucks meets Captain Hook; his skill as actor simply shines as he leads the boys down the proverbial primrose path that crime offers with compassion and love. Treat, on the other hand, has made a living leading Phillip and others up the old garden path. I’ve said it before and I’ll say it again, no one dives into the deep end of darkness like Ben Foster. He definitely didn’t disappoint in his Broadway debut. Foster’s portrayal of Treat is steeped in complex layers of pain that made me want to clutch my purse in fear only to feel an emotional 180, desiring to give him a comforting hug, which he probably wouldn’t accept. Tom Sturridge’s interpretation of Phillip offered a sense of sincere dynamism and vulnerability. I enjoyed how he used John Lee Beatty’s set design as his own personal parkour course, strategically crouching and jumping at will as if he was using the art of misdirection to keep Treat unaware of his true intelligence. Despite all the drama the occurred before Orphans began previews; the drama present on stage is dark, delicious and a great display of acting that is sure to garner a Tony nomination, or two, or three. In boxing, a sure way to get a knock out is to connect two punches to the body and one to the head. Orphans executes a theatrical blow that could rival a Mike Tyson KO back in the 80s. And like Tyson, Baldwin, Foster and Sturridge show that hitting with bad intentions can sometimes be a good thing. A couple of wayward children are about to make their way onto Broadway stage but they ain’t like the little girl with the auburn locks and her sassy crew crooning about a hard knock life. These boys mean business and they plan to survive by any means necessary. 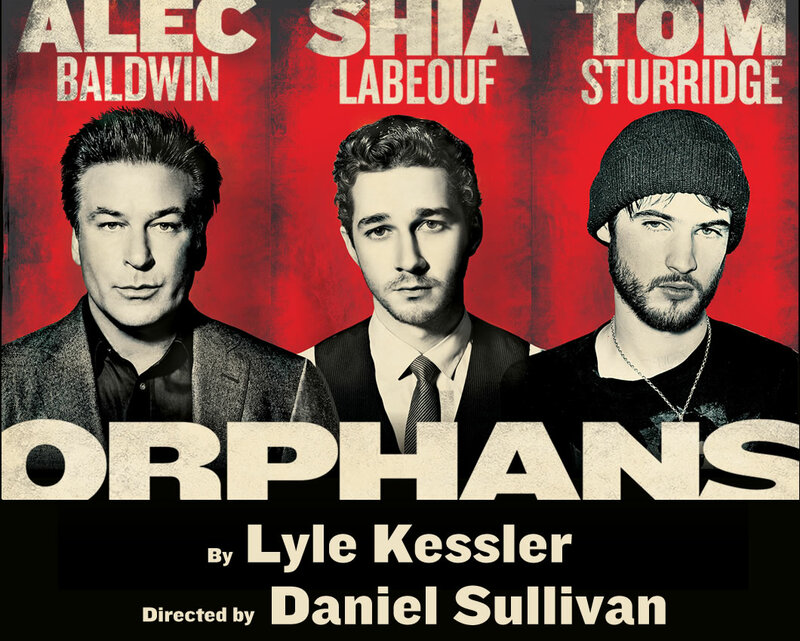 This spring Broadway gets a little dark and dirty with Orphans starring Alec Baldwin, Tom Sturridge and Shia LaBeouf. To give you FAMERS a lil’ hint about the show, let me provide you with the “official” description: Two orphaned brothers live in their decrepit North Philadelphia row house. They survive by petty thievery and a steady diet of tuna fish and daytime television until the violent older brother decides to kidnap Harold, a notorious Chicago gangster played by Alec Baldwin. Harold soon becomes the force that will forever change their lives. Got your attention yet? It sure has mine! Written by Lyle Kessler and directed by Daniel Sullivan, Orphans is debuting on Broadway 30 years after its premiere. La Beouf will also be making his Broadway debut as well. I for one could never resist a Baldwin brother, so I’m super excited to see Alec Baldwin moving from 30 Rock to Times Square. Orphans will be playing a limited 15 week engagement at the Gerald Schoenfeld Theatre and is scheduled to premiere on April 7. Get ready to get your tickets and get naughty. To learn more about Orphans or purchase tickets, visit http://orphansonbroadway.com/.